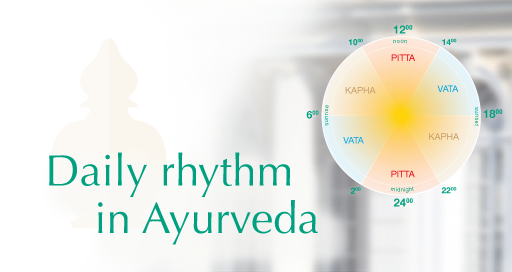 From 6 to 10 in the morning, the slow-moving Kapha Dosha dominates. That is why breakfast should be light, so as not to burden the morning with a feeling of heaviness. Bright sunshine stimulates the metabolism. 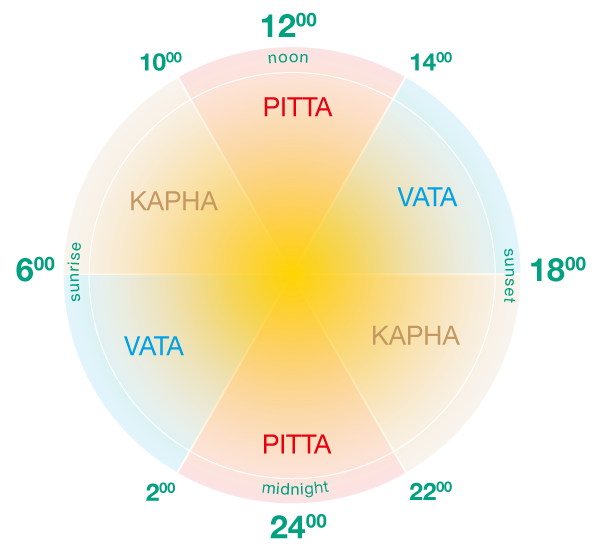 Pitta Dosha is most pronounced at noon, when the sun is at its highest point, and at this time of day, hunger is greatest and rich food can be digested. For this reason, it is advisable to take the main meal when the sun is at its zenith: around noon. Between 2 and 6 in the afternoon, Vata prevails. At that time, Vata people feel slightly exhausted and restless. Then some hot water or warm milk with spices is recommended. In the early evening, at the end of the day, all nature comes to rest and Kapha Dosha dominates again. As the metabolism slows down at this time, a very light evening meal is most beneficial. The old German rule “In the evening, eat like a beggar” reflects knowledge of these physiological connections. Towards midnight, Pitta is active again – the mental impressions from the day are processed during sleep. Despite the Pitta dominance during the night, one should not eat anything anymore, because at that time the metabolism is stimulated not for digestion, but to carry the nourishing elements digested during the day from the blood stream into the cells and thus strengthen the body. Very early in the morning, between 2 and 6, we are influenced by Vata. Since this Dosha is responsible for movement, it is advisable to rise shortly before sunrise in summer and before 6 a.m. during winter time. This is the best way to stimulate the entire metabolism and ensure a good start into the day.